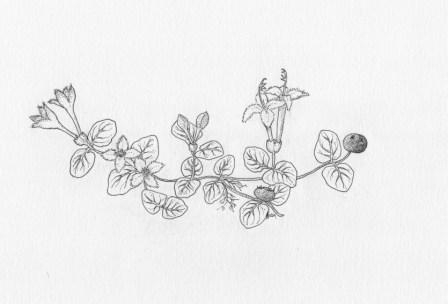 Although partridge berry is a small and creeping herb, its jewel-like beauty rewards attentive naturalists year-round. 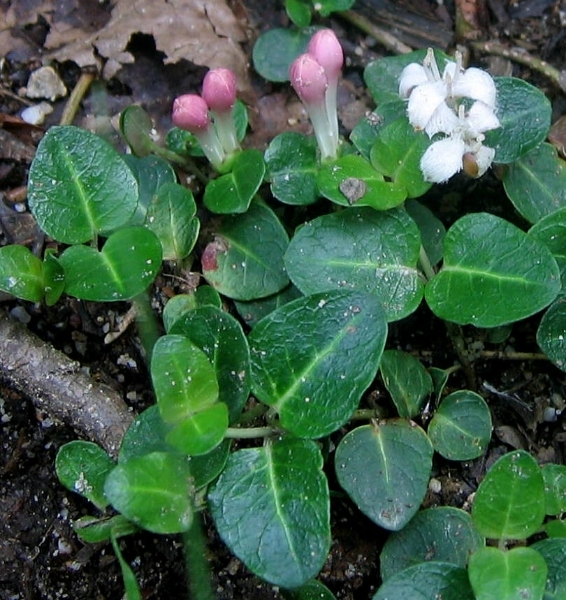 Partridge berry is a low-growing, herbaceous perennial that forms mat-like colonies of interlaced stems on the forest floor. Near their growing tips, stems are smooth or, when young, sparsely hairy; in older sections of a colony, stems bear adventitious roots. Branch stems arise either singly or in pairs, frequently from nodes below the previous year’s fruit, but sometimes from other nodes as well. 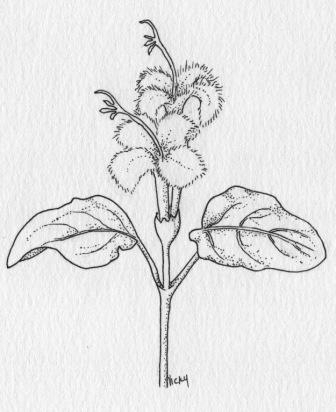 The 1-2-cm-long leaves are opposite, evergreen, round to ovate, and somewhat leathery; the upper leaf surface is glossy, with a whitish mid-vein. Successive pairs of leaves are off-set 90° from the pair above and below, but this decussate arrangement is often obscured in older, fully prostrate, stems. Small, sharp-pointed stipules extend between petiole bases on each side of the nodes. Typically, flowers form in pairs at the ends of slightly upturned stem tips. The paired flowers have a common pedicel and exhibit various degrees of fusion with each other, especially in their lower regions. 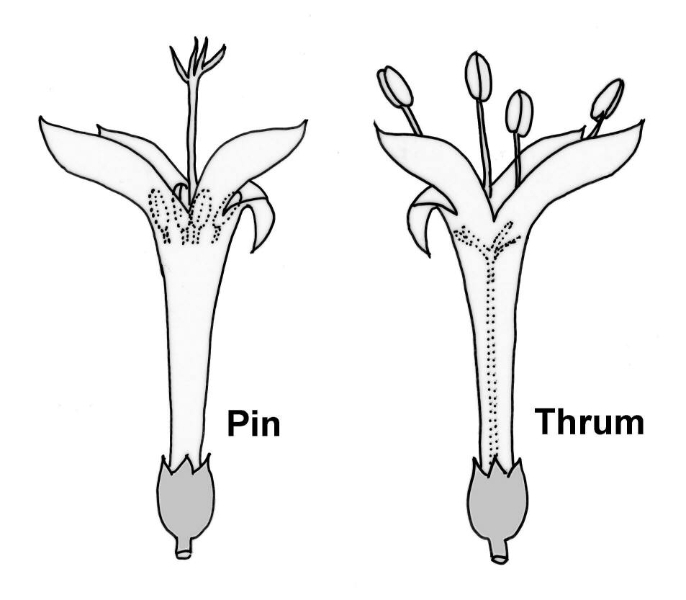 There are four scale-like sepals at the base of each flower, but these commonly fuse together, forming common calyx for the pair of flowers. 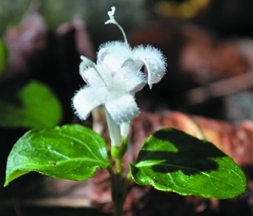 Four white petals form a gradually expanding corolla tube that ranges from 9 to 14 mm in length and is topped by spreading lobes that are 3-4 mm long and densely hairy on their inner surfaces. Rarely, corollas of adjacent flowers also fuse together. There are four stamens, alternate with and attached to the petals. Relative lengths of stamens and styles vary from plant to plant, an arrangement known as distyly. In some flowers the pollen-bearing anthers are included within the corolla tube and the four strap-like stigmas extend beyond the petal lobes. In other flowers, the stamens protrude and the stigmas are hidden inside the tube. At the base of the corolla tube a ring-like nectary sits atop the inferior ovary. Ovaries of adjacent flowers coalesce to form a red berry-like fruit, 7-10 mm in diameter, containing up to eight seeds, and capped by the persistent scale-like sepals. Rarely, white fruits are found. The genus name, Mitchella, commemorates John Mitchell (1711-1768), Colonial physician and naturalist from Urbanna; repens refers to the plant’s creeping stems and adventitious roots.Mitchella is classified in the madder family, Rubiaceae, and is therefore related to other Virginia native plants such as bluets (Houstonia), buttonbush (Cephalanthus), bedstraws (Galium), and a host of familiar tropical plants, including coffee (Coffea), quinine (Cinchona), and ipecac (Carapichea, formerly Cephaelis). 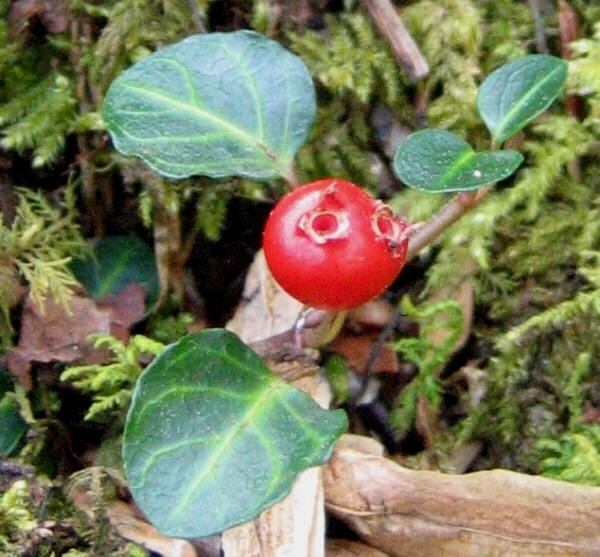 The only other species in the genus, Mitchella undulata, from Taiwan, Korea, and Japan, is similar to our North American plant.Although edible, partridge berries are described as tasteless or, at best, mildly aromatic. Native American women consumed tea made from the leaves and fruits to treat a variety of obstetric and gynecological conditions. Other traditional and historical sources assert additional medicinal properties, including calming of nerves and easing of gastrointestinal conditions. 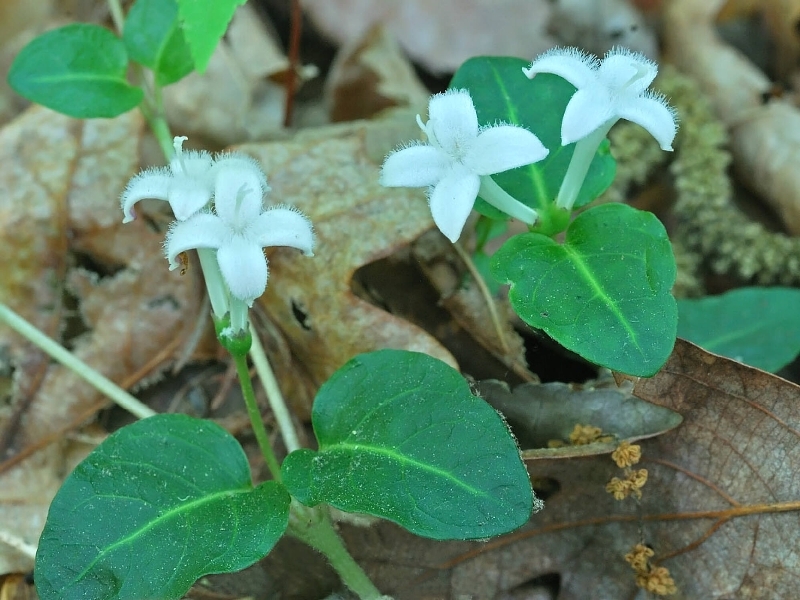 Mitchella repens is a woodland plant that can be found in moist bottomlands as well as somewhat drier ridge tops. In Virginia, flowers begin to open in May, and continue sporadically through the summer. Bumblebees pollinate the flowers. 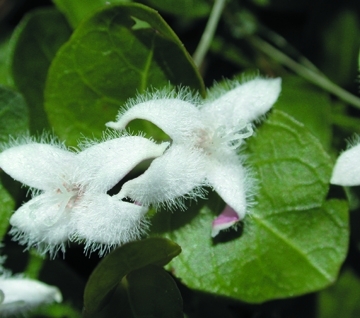 Cross-pollination, required for seed set, is controlled by factors that permit germination of pollen from long anthers only on the stigmas of a different flower with a long styles; conversely, pollen from short anthers can germinate only on the stigmas of a different flower with a short styles. Fruits mature in the fall and are retained through the winter and spring. Ruffed grouse, bobwhite quail, wild turkey, skunks, and white-footed mice consume partridge berries. 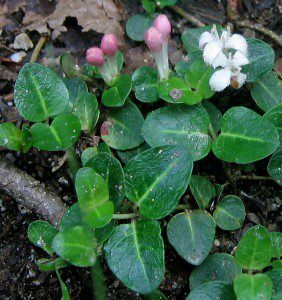 Partridge berry is an excellent plant for the woodland garden. The glossy evergreen leaves are attractive year-round, and, although small, the flowers and fruits add interest through multiple seasons. 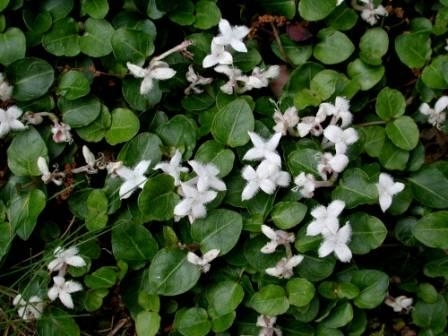 Mitchelladoes best with some shade, even moisture, and mildly acidic soils; it does well, for example, among acid-loving shrubs. 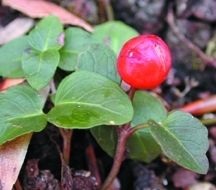 Partridge berry makes an interesting subject for a shaded rock garden; it is also a popular inclusion in a terrarium. It can be grown from seed; fall-collected seeds should be cleaned of fruit pulp and moist stratified for 6 weeks to enhance germination. However, ease of rooting makes vegetative propagation the favored option; softwood cuttings can be taken in the spring or summer. 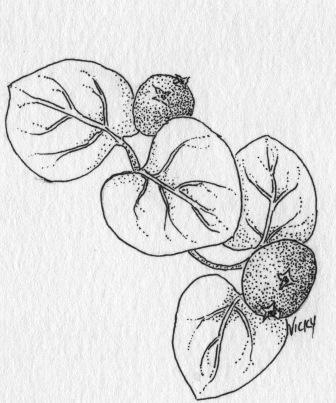 Partridge berry is widespread in eastern North America, from southern Canada to Florida, and west to Minnesota and eastern Texas; additional populations are known from the mountains of southern Mexico and Guatemala. It is found throughout Virginia. Although partridge berry is both widespread and relatively abundant, individual populations may be threatened by collection of wild plants for horticulture, encroachment by invasive exotic plants and habitat destruction.To see and learn more about interesting species of plants native to Virginia, visit our www.vnps.org and contact your local chapter of VNPS (details on website) for the times and dates of programs and wildflower walks in your area. Text by W. John Hayden; Illustrations by Nicky Staunton and W. John Hayden; Photos by Richard Stromberg, Richard Moss, and Gary Fleming; Brochure Layout by Nancy T. Sorrells; Web format by Deanna High.